Getting an aquarium installed, especially after planning it for a long time or if it was mostly a do it yourself project, feels like a big accomplishment. Of course, aquariums are ecosystems filled with living creatures, and since they are artificial environments, they do not maintain their balance naturally and a beautiful aquarium can quickly turn into a chamber of horrors for the aquatic creatures if you do not constantly monitor and maintain it. If you build a ship in a bottle, you can spend years’ worth of lazy afternoons admiring the fruits of your dedication and craftsmanship, but if you try to do that with an aquarium, you can expect a few days of watching your scaly friends go about their business, but if all you do is watch, it will not be long before you see them floating belly up. 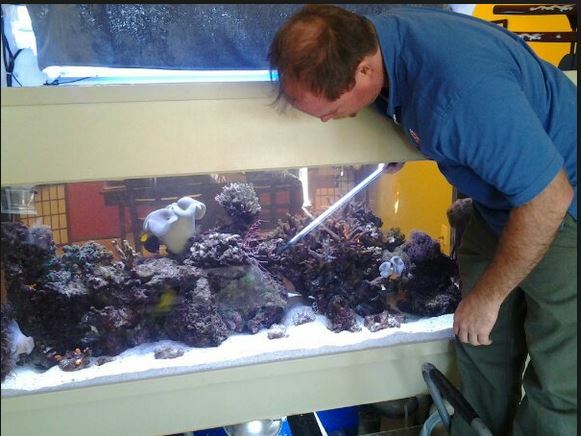 Aquarium maintenance can be tedious even for the most dedicated of marine life enthusiasts. This is especially true in the case of workplace aquariums, since everyone is so busy doing his or her job that keeping track of the pH in the aquarium is the last thing on anyone’s mind. You can count on Michiana Fish Services to perform maintenance on home and workplace aquariums at regularly scheduled intervals. The installation and maintenance of aquariums is what we do best, so that you have more time to spend providing service to your customers or letting your kids marvel at the mesmerizing movement of fins and gills. In addition to routine aquarium maintenance, such as testing and changing the water and preventing the growth of algae, we can also make a variety upgrades to your aquarium in ways that will not disturb its denizens. If you have set up an aquarium or we have installed one for your, but you want it to be more eye catching, then our post-installation services may be right for you. We can install colorful LED lights in your aquarium. LED lights are very popular with large aquariums in restaurants and hotel lobbies; imagine a floor to ceiling aquarium full of undulating jellyfish that seem to change color with every color change of the LED lights. If you want your home to be the scene of a poker night as visually impressive as poker games at the casino, adding an LED light display to your aquarium can help you toward that goal. If making Nemo the star of a Pink Floyd laser light show in your very own home isn’t your cup of tea, there are plenty of other ways we can beautify your existing aquarium. We can add brightly colored fish and aquatic plants that can thrive in the same environment as the fish you already have in your aquarium. If you are happy with your aquarium and your fish but would just like to add a little bit of color, we can add decorative stones and gravel to your aquarium. Call us today to see what kind of services and upgrades are right for your aquarium.